As posted by the Kitchener/Waterloo/Cambridge Record, December 3, 2013.
International Volunteer Day is a global celebration of volunteers. Founded in 1985 by the United Nations, it takes place annually on December 5 to recognize volunteer efforts in our community, in our provinces and territories and across the world. Volunteers are leading social change right before our eyes. While we worry about Christmas shopping, the newest fashion trends, and what our weekend plans are, there are 40,000 residents of Cambridge and North Dumfries thinking about how to help someone through their volunteer work this coming year. Helen Scutt is a volunteer member of the United Way’s Community Impact Council. She is also a ‘Travelling Volunteer’ with a Toronto-based charity, Sleeping Children Around the World (SCAW). Her first trip with SCAW was to Kenya in 2010. 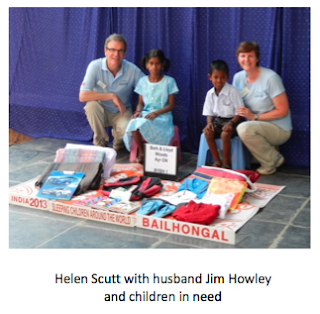 She and her husband Jim Howley travelled with a team to India this year to distribute bedkits to 7,000 children identified in the greatest need. The bedkits include a mosquito net to prevent malaria, sleeping mattress, blankets, school supplies and new clothes for the children. The organization works with Overseas Partners, such as Rotary Clubs, who purchase the bedkit materials locally, identify bedkit recipients, and arrange volunteers for the distribution days.